Stag's Horn Sumach (Rhus typhina): growing, planting, caring. Did you know? The specific epithet typhina is explained in Linnaeus's description with the phrase "Ramis hirtis uti typhi cervini" meaning "the branches are rough like antlers in velvet". 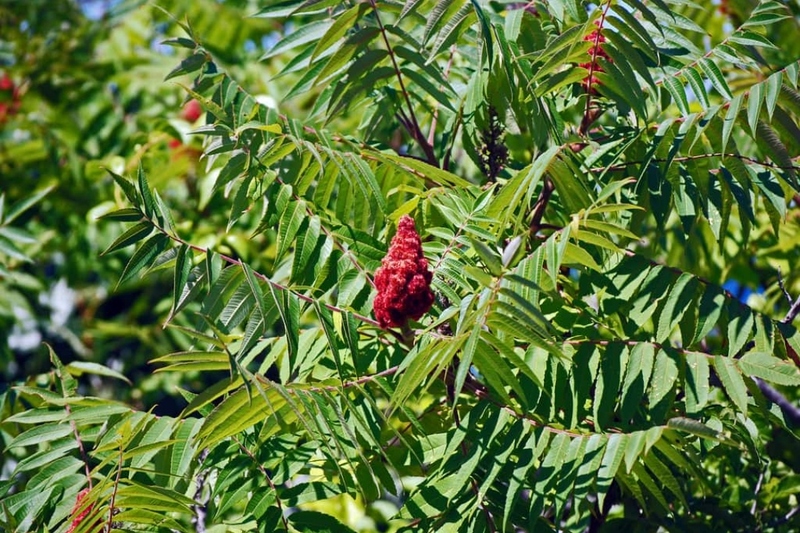 Full description for Rhus typhina not yet available. Plant between October and the end of March but not during frost periods. Check that the desired location meets the requirements described in the description, and avoid working in soggy soil. Dig a hole two to three times as wide as the root ball of your tree. Handle the root ball carefully to keep it intact while you place it in the hole. Put your shrub to the correct height, and replace the soil, respecting the order of the layers of possible - bottom layer to top. Tamp regularly. After planting, pour two watering cans at the bottom, then place a good layer of mulch.